Helen’s Buttermilk Skyscrapers | What about this? 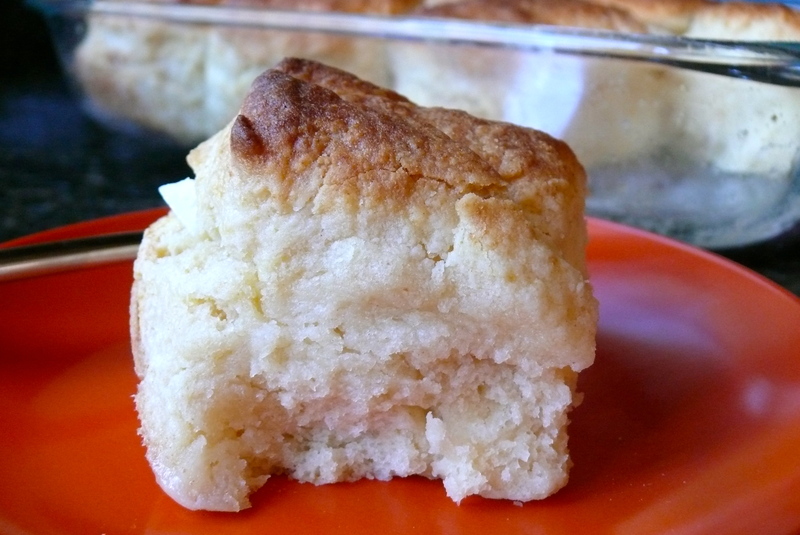 Light, fluffy, buttermilk biscuits, hot out of the oven, sit on the kitchen counter waiting to be slathered with butter and honey. When gently pried apart, the crisp exteriors yield to delectable oh-so-tender interiors. Having eaten my share of convenient, store-bought, “canned” biscuits in the past, there’s still nothing better or as welcoming in the morning to me as a basket of warm homemade biscuits. This is breakfast, very simply, at it’s best! 2. Sift the flour with the baking powder, baking soda, salt, and sugar in a large bowl. Cut in the butter with a knife. Blend with a pastry blender until the texture of coarse crumbs. 3. Stir in the buttermilk with a wooden spoon to form a soft dough. Knead briefly on a lightly floured board. Roll dough out 1¼ inches thick. Cut into 3-inch rounds and arrange with sides touching in a buttered 9-inch square cake pan. Brush the tops with the melted butter. Bake until golden, about 25 minutes. 1. Keep the butter in the refrigerator until it’s time to use it. The butter needs to be well-chilled, so that it forms small pockets of fat in the biscuit dough. The fat must melt during the baking process and not the dough-making process. As the butter pockets melt, CO2 from the leavening agents takes their place and makes the biscuits rise and become fluffy. 2. The less you handle the dough, the more tender your biscuits will be. Overworking the dough develops gluten and breaks down the butter pockets. 3. Biscuits are baked quickly, hence the super hot oven. Because of this and the butter coating on top, watch these biscuits carefully after about 15 minutes in the oven. The tops can turn very dark or burn if you’re not paying attention to them. 4. For best results, make sure your baking powder and baking soda are fresh and not close to their expiring date. This sounds amazing! Everyone in my family knows I’m a huge carb-lover.. perhaps I’ll make this for them at Thanksgiving!